They said “it couldn’t happen here”—but in the summer of 1938, unbelievably, it did. During one of the Great Depression’s lowest periods—and perhaps because of it—New York found its state government seized by authoritarian crooks, and its population taking up arms in order to restore democracy. Chillingly, this all came about through fair elections and normal legislative process. Battered by years of strife, and seduced by a lavishly funded political campaign, New Yorkers unwittingly handed the reins of power over to a new, untested political party which history would reveal was secretly controlled by criminal elements. Within a few short months, New Yorkers would see their wealth plundered, their streets patrolled by jack-booted thugs, and their neighbors imprisoned or executed. 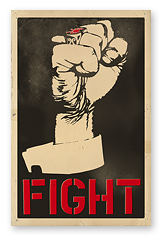 With the federal government unwilling to intervene and the news media silent, it was up to the people themselves to fight this new Empire State. This site has been created chiefly to salute the forgotten heroes that fought our second revolutionary war, but also to publicize a neglected chapter in U.S. history. It is a cautionary tale particularly relevant in post-9/11 America—especially today, given the parallels between the Great Depression and our own. Read on to honor the heroes, but also because it can happen here. In 1938 Americans were in the ninth year of the Great Depression. By this point, the decade had witnessed the near failure of the nation’s banking system on three occasions, massive unemployment as factories closed and industrial production plummeted, and a catastrophic collapse of the country’s farm economy. 1938 saw the onset of a recession and a big jump in unemployment that threatened to undo the fragile recovery that had, until then, been underway. Against this backdrop, New York state elections were swept by Governor Whiting and other candidates from a “reform” party called The Party of Justice. Tragically, the only change they offered was to citizens’ freedoms and their own coffers. 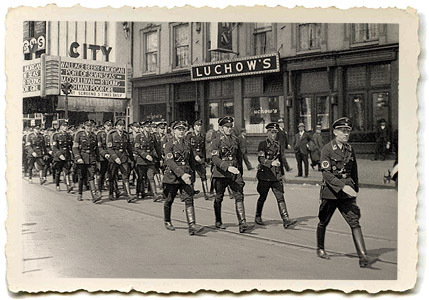 Holding majority control of the state legislature, they quickly created what was essentially a police state and they did it “legally” just as the Nazis had done in Germany. A month into the new administration, they passed legislation imposing burdonsome taxes on the middle and lower classes, with a rider empowering a new, special police force to collect them, the New York Bureau of Investigation. 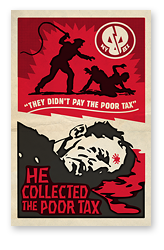 There was no fanatical ideology behind the Party of Justice as with the Nazis, just plain greed. 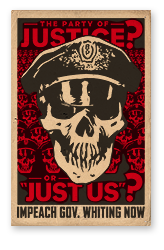 And without the patience to create a cult-like following, the Party would look to the state's prisons for like-minded individuals to fill its questionable new police force. 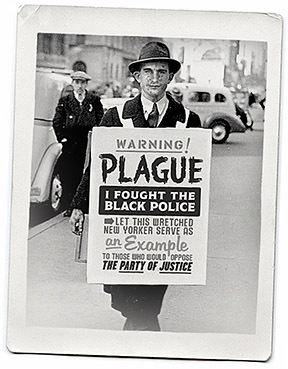 Populated with thugs, the NYBI became known as the "Black Police" as much for their deeds as for their attire. Non-payment of taxes resulted in flogging and the seizure of property. 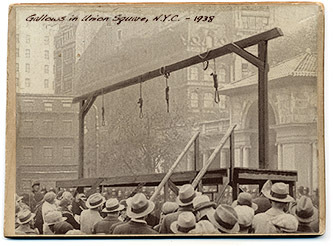 Resistors were publicly hanged. And yet, this was not the only grisly threat levied against New Yorkers; We must not forget the concentration camps. What began as typical pens for troublemakers quickly became installations of unrestrained depravity under the supervision of the Black Police, most of them former prisoners themselves. With the Party of Justice holding the state government, public services and the even news media in its iron grip, and with the federal government unwilling to intercede—except, ultimately, on the side of the legally elected state officials—there was to be no political solution to the madness that had gripped New York. The resilient citizens of the Empire State would have to take back their home themselves—by force! Sadly, we will probably never get a true accounting of the sacrifices made. Because of the total control exerted by the Black Police, consequently not many incidents of resistance ever made it into the official historical record during this period. According to stories passed down orally, there were pockets of resistance in every corner of New York, from Buffalo to Albany to Manhattan, and every small town in between. 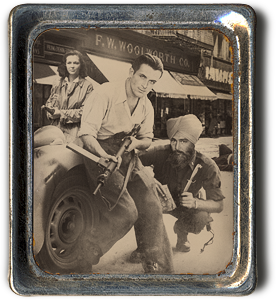 From what we gather, the largest group of resistance fighters operated out of the Catskill Mountains. Their leader, if we are to believe what “official” history does exist, was deposed New York City police commissioner (and former governor) Stanley Kirkpatrick. Unofficially many of the rebellion’s most effective operations were led by a vigilante known only as The Spider. Considered simply an urban legend for the better part of the previous decade, The Spider emerged from the shadows to become a resistance leader when the crime he had pledged himself to fight outside the law had set themselves up as the law. After the War for New York was won, the Spider continued his extra-legal activities and so his contributions to restoring sanity to the state were sadly unheralded, if not dismissed entirely. The official historical records surrounding the rebellion of 1938 have all but expurgated the contribution of outlaws like The Spider. (Much as they have whitewashed the whole affair to soften what was an appalling failure of the American political system.) 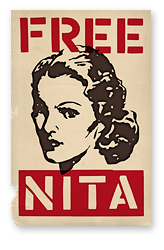 A different story is told, however, by primary sources from the period such as the protest posters that were created by some of New York's most talented—and being poor, most persecuted—artists in an effort to circumvent the Whiting administration's stranglehold on the media. 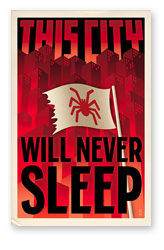 Here, The Spider leaps to the fore as a leader of the resistance if not it’s symbol. Click on the thumbnails for larger jpegs and PDF download option. The New York rebellion of 1938 didn't actually happen—except in the pages of The Spider magazine, one of the most popular and imaginative fiction magazines of the Thirties. The Spider was one of our earliest urban superheroes, sharing news racks with the likes of Doc Savage and The Shadow from 1933–1943. In the Spring of 1938, author Norvell W. Page, no doubt shocked by events in Europe and concerned by America's own Depression Era unrest, set about writing an epic like no other. Over three novels pulp fiction’s most electrifying wordsmith would spin an unusual yarn pitting his masked hero not against some impossible flame-throwing madman or zombie horde, but against a very real and very relevant threat—totalitarian rule. The “It Can't Happen Here” of the pulps reprinted for the first time! The Spider Vs. 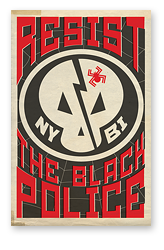 The Empire State: The Complete Black Police Trilogy collects three exciting pulp classics for the first time in book form, “The City That Paid To Die,” “The Spider At Bay” and “Scourge of the Black Legions,” all wrapped in an award-winning design that features the original illustrations by John Fleming Gould and John Newton Howitt. Find out more about The Spider and pulps at SpiderReturns.com.